Ko Muk (also referred to as "Koh Mook") is an island in the Southern Andaman Coast region of Southern Thailand. Muk is the Thai word for pearl, so Ko Muk means Pearl Island. The island is home to a majority Thai-Muslim population, with tourism being the main and almost sole industry. Nearly half of the island is National Park. Cliffs and mountains form the centre and northern parts of the islands with a large double sided beach to the far East point. 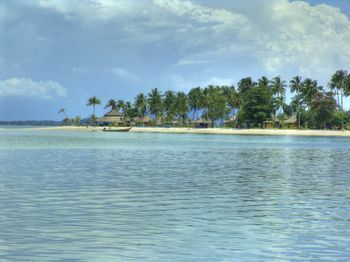 A further beach lies to the west of the island inside the national park area. However, this beach is now home to a deserted hotel resort which was built without the correct permission from authorities. It is now closed but the beach still accessable. Rubbish disposal is a huge problem for the island. There is no garbage disposal or recycling facilities on the island. Rubbish is simply burned. Large amounts of rubbish can be seen on beaches, on the road sides, and general dumped in open places. Combined minibus and boat tickets can be booked from any Trang 'tourist information' shop. A minibus to the nearest jetty and a longtail boat to Farang Beach will cost 300 baht. The 11:00 minibus to the nearest jetty and aboard the only ferry, departing once a day, costs 250 baht. The driver of boat and minivan is the same person. If you take the latter option it's recommended to arrange accommodation and a pick-up from the Ko Muk pier, otherwise you may have a 3 km walk, depending on the location of your hotel, or 50 baht motorbike taxi ride to get anywhere on arrival. However, many hotels are within easy walking distance of the pier. The return trip is easier and cheaper, with the same ferry departing at 08.00. With no booking fees or middleman it is possible to get the ferry for 50 baht and minivan to Trang for 100 baht, although 200 baht is the more likely combined fare. All in tickets can be purchased for 250 baht from the many travel agent shops located in Trang Town. A second ferry departs at 9.30 with an increased cost of 350 baht per person. The closest airport is Trang. Which has daily flights from Bangkok via Nok, Thai Lion and Air Asia. Nok Air offers a package from Bangkok to Ko Muk including flight, transfer, and boat. A tuktuk to the other side of the island will cost you 50 baht per person. Renting a motorbike at one of the resorts near Farang Beach will be around 400 baht, while renting one on the other side of the island (in the fishermans village) will be only 250 baht. The island is relatively small though, to get from the pier on the east coast to Farang Beach will take you about 30-45 minutes of walking. Hilltop Restaurant: Cheap and friendly staff. Mookies has "tentalows" for 250 baht and huts for 300 baht. Hot showers and a bar area available. The huts are dingy, with nothing but draughts, a light, a mattress and a fan. Intermittent electricity. Probably the best place to stay on the entire island Bungalows 1300 high season 400 low season for standard 1700 and 500 low season deluxe, most have fridge and hot shower. 5 minute walk to Farang Beach It is very cool on a night due to the mountain breeze. Had Farang Bungalow (+66878844785 or +66815844648, [email protected]) Had Farang have clean, well maintained bungalows. 400 baht with shared bathrooms and fan, 500 baht with private bathrooms and fan. Up to 800 baht for air-conditioned bungalows. Resort accommodation is available fronting onto Farang Beach. This page was last edited on 6 December 2018, at 04:38.